Lucy is a black and tan female from the Spindrift line. In the bottom left picture you see her on the bow of our boat at four months old. I am not sure if she was named after our boat or if the boat was named after her. In the background, you see the scenic Fox River for which our kennel is named. 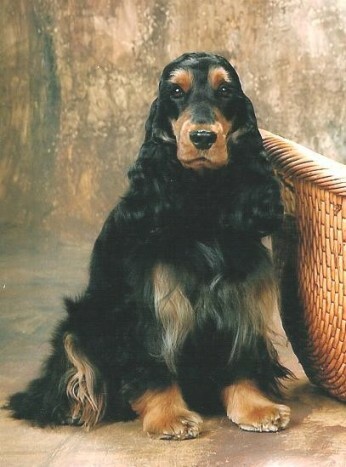 Lucy is a beautiful example of a black and tan English Cocker which is considered a solid color. She most recently earned her Rally Excellent title. Lucy shares her time with us and our daughter Amy in Madison, Wisconsin. She was bred to CH Deja Vu Blockbuster, “Drew” owned by Beth Hendricks – Deja Vu Kennels in West Virginia. In 2005 she whelped four puppies pictured below, one of which is our solid black English Cocker, Fox River Wild Rose, “Rose”. Can you figure out which black puppy is Rose? Scroll down for the answer. Fall of 2012 Lucy was diagnosed with a slow growing mammarian cancer and autoimmune polyarthritis. As of today, almost 12 years old, she is still doing fine and is playing with the Welsh puppies.